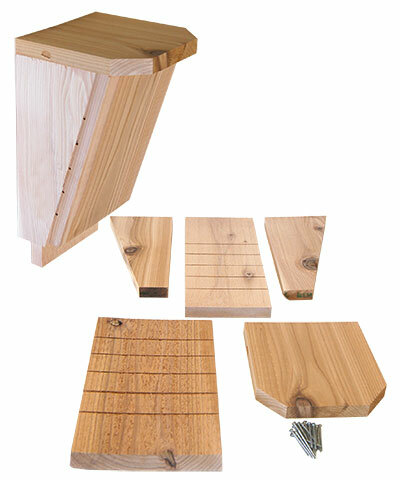 Turn your child into a bat enthusiast with this Songbird Essentials Bat House Kit. Bats not only offer wonderful, all natural pest control; they also are excellent pollinators to help your garden thrive. This package of rough hewn, cedar panels and hardy screws provides virtually all you or your child needs to create a small bat house, for easily appreciating these wonderful animals. Step-by-step instructions on the back of the package ensure straightforward assembly, requiring only a hammer, pencil, and ruler for a fantastic rainy day project. The DIY home's single chamber is perfect for 20 bats, and the extended landing pad enables them to enter it easily. Not only is the interior of each panel rough hewn; each also sports deep grooves for bats to cling easily. A keyhole opening on the back of the shelter makes it simple to attach to a home, tree, or post using just a nail, and the hardy cedar construction withstands exposure to the elements. Offer these fantastic flying mammals a lasting roost and help your kids or scout group celebrate bats with this Bat House Kit. Assembly required. Made in the USA.